In the last couple of decades, hardwood flooring has become a very popular flooring material for homeowners and business owners alike. Given the long life and versatility that this sustainable material has to offer, it’s not surprising to learn more and more people are choosing to install it. In today’s article, we’ll review a few qualities that make hardwood one of the easiest ways to customize the look and feel of your space. If you’re a resident of Fort Collins or Loveland and considering replacing the floors in your home, contact Mountain Valley Floors! We are your Top Rated Local® flooring pros, and we’d love to help you discover what hardwood can do for you! Contact us today! How Can I Customize My Hardwood Floor? 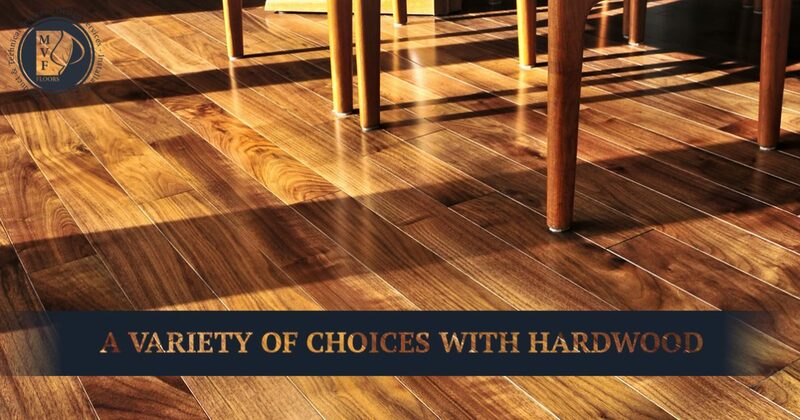 When considering hardwood floors, many people assume their only choices are the standard-sized planks that come in the usual stains and finishes. However, thanks to innovations in manufacturing and installing techniques, there are so many more options available to homeowners. Let’s take a look at three of them! If you’re someone who has kids and pets, it’s likely that you’ll choose a wood that’s known for its durability, such as oak or mahogany. These species of woods are extremely hard and hold up to wear and tear well. Some people prefer softer species of wood for a little bit of a different look that will show its age more quickly, providing a unique style with character. If you’re interested in learning more about the hardness of various species, check out the Janka Hardness Rating scale. The most common installation method for hardwood flooring is to install it in rows that run parallel to the longest wall in the room. 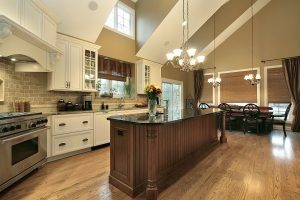 This is frequently done because it is most cost effective in terms of labor and materials, however, it is not the only way to install hardwood to ensure a beautiful finish. Many people choose to install the wood in a diagonal or herringbone pattern for a truly custom look. While this might cost more in the long run, you’ll enjoy beautiful and unique floors for a lifetime with proper cleaning and maintenance. When it comes to the most common width of planks for wood floors, two to three inches is pretty standard. If you’d like to create a more formal tone to your space, you can consider thinner planks. Thinner planks lend themselves well to a clean and polished look. They are also great for forming geometric patterns for a focal piece on your floor. If you prefer a more rustic look, wider planks are the way to go. Combining various widths of planks can also be a great way to create a one-of-a-kind look. Are you ready to begin your next flooring project? With more than 25 years of experience and complimentary design assistance, you can’t beat Mountain Valley Floors! Call us today at 970-372-4019 to get started!